This listing is for 10 Baby One Piece Soap Favors in your choice of color and scent. Each favor includes one baby one piece soap. Soap measures apx. 3" tall and 2" wide and 1/4" thick. We can also add a pinch of cosmetic safe glitter for a little pizzazz. Ingredients: Coconut oil, palm oil, safflower oil, glycerin, shea butter, purified water, sodium hydroxide, sorbitol, sorbitan oleate, soy bean protein, titanium dioxide, micas, cosmetic safe glitter, fragrance oil, may contain cosmetic safe glitter. Not only do these look adorable, but each soap is made from our luscious lather shea butter moisturizing soap base and will leave your skin soft and moisturized. 4) GLITTER OR NO GLITTER? Seller was very helpful and responsive. 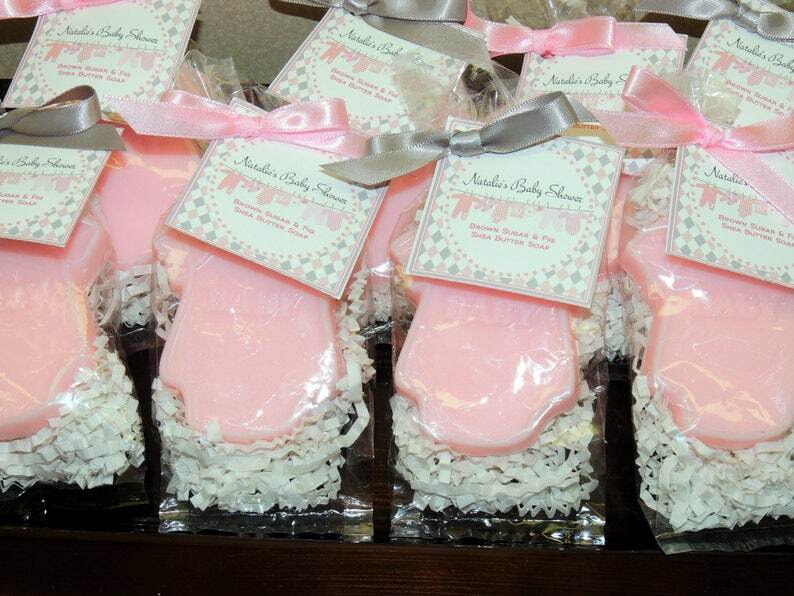 Worked with me in getting the soap tag designs the way I wanted them to coordinate with my baby shower theme. Order was shipped and received fast as well. Had a slip up with missing 1 soap from my order, but she was very kind to send me one plus an extra one :) thank you again!! I ordered these soap favors for my friend’s baby shower. They are so adorable! I highly recommend them. I had an excellent experience communicating with this business as well. They were thorough and very helpful in their responses. I can’t wait to give these to our guests!